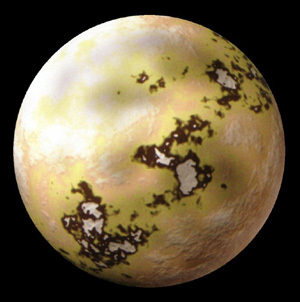 Sullust was the primary planet of the Sullust system in Sullustan Space, located in the Outer Rim at the conjuncture of the Rimma Trade Route and the Silvestri Trace. It was the homeworld of the Sullustans. The two moons of Sullust are called Umnub and Sulon. The planet joined the Galactic Republic when Sullustan merchants connected their planet to Tapani Sector with the Rimma Trade Route 5,500 years before the Battle of Yavin. The planet was the headquarters of the Galaxy-spanning SoroSuub Corporation, a member of the Commerce Guild. Nearly one-half of the population was under its employment. As the Old Republic crumbled, the governing Sullustan Council became weak. Under President Beolar Bribbs, the planet seceded from the Republic 22 years before the Battle of Yavin and joined the Confederacy of Independent Systems. During the Clone Wars, Jedi Knight Rees Alrix led a mission to Sullust. With the expansion of Palpatine's New Order, SoroSuub assumed leadership of Sullust with Proclamation 173d and announced its full support of the Empire. In exchange for several lucrative contracts and the promise of guaranteed future business, SoroSuub took a hardline against the Rebel Alliance and its supporters. Angered at SoroSuub's illegal takeover and support of the Empire, Sullustans formed resistance cells under the leadership of Sian Tevv that became model rebel cells during the Galactic Civil War. Tevv's resistance fighters, combined with a coup to take over SoroSuub by pro-Alliance forces, garnered enough support to wrestle control of Sullust away from SoroSuub shortly before the Battle of Yavin. The Sullustan resistance remained independent from the Alliance, although it allowed their fleet to use Sullust as the staging point for planned destruction of the Death Star II, since Sullust was an endpoint of the Sanctuary Pipeline as well as due to a board chairman of SoroSuub being rescued from Imperial detention by Rebel Forces. The Alliance also launched a diversionary attack in the system, to draw the Imperial fleet away from Endor. After the Battle of Endor, Sullust officially aligned itself with the Alliance, and subsequently the New Republic. It was represented on the New Republic Provisional Council by Sian Tevv and later in the New Republic Senate by Sien Siev and Niuk Niuv. Sullust went on to be a key member of the Galactic Alliance.